The city of Prague is filled with history, art, and architecture. It's also a favorite destination among backpackers who are looking for an affordable city with a lot to offer. Most visitors choose to stay near the Old Town Square, where you'll have easy access to most of the city's most popular sights and attractions. These hostels are a favorite among budget travelers. This hostel is in the perfect location in Prague. It's just steps from the Old Town Square (Staromestske namesti) and is in the heart of the historical center of the city. You can walk to many of the most popular bars, clubs, shops, and attractions. It's also a top rated hostel among visitors. 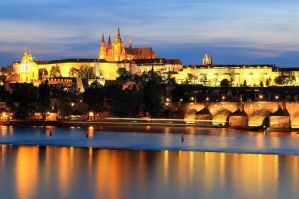 It's a five minute walk from the Charles Bridge, a ten minute walk from the Main Train Station, and five minutes from Tesco department store. Other perks that that hostel offers include free internet access and wi-fi, free breakfast, free linens and towels, a baggage room, pub crawls, and a kitchen that guests may use. The facility is clean and comfortable and has been recently renovated. The staff is available to offer and travel information you may need including how to get around Prague, what to see, and things to do. Also just steps from Prague's Old Town Square, this hostel is located in a beautiful 16th century building that features renaissance ceilings and an impressive decor. It's only 400 meters from the Charles Bridge and is in one of the most popular areas of the city. The hostel has a relaxed atmosphere where you can meet travelers from around the world. There's a shared kitchen available to guests and a common room where many people enjoy watching movies. The staff is available to help with any questions you might have and there are private tours of the city that you can participate in. This is the perfect hostel if you're looking for a social setting with a good location at an affordable price. This hostel is actually located right on Wenceslas Square, in walking distance of the Old Town Square. It's set in a beautiful historic house and is in easy access of many of the city's best attractions as well as public transportation. It's surrounded by the commercial, cultural, and historic heart of the city. The hostel has a comfortable and relaxed vibe. There are a range of dorm and private rooms available at very affordable prices. There is also wi-fi available throughout the hostel and a large terrace on the top floor where you can relax and have a cigarette. Hostel Rosemary is also in walking distance of both Wenceslas Square and the Old Town Square. You can walk to many of your destinations so there's really no need to use public transportation. For those arriving by train, it's also just a short two minute walk from the main train station. The hostel is run by a local Prague family and they know the area well and will work hard to make sure you enjoy it. The hostel is popular among a diverse group of travelers including backpackers, students, large groups, couples, and families. There are also free tours of the city available to guests which start every day at 10:45 am and 2 pm.